Thais build little hosues outside their buildings for the spirits to live in. The idea is that the spirit houses are nicer than the real houses so the spirits will live their and leave the human occupants alone. 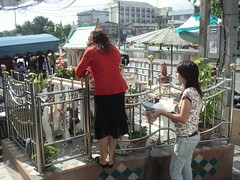 Every morning fresh incense, food, and drink is provided for the spirits.